React is fast! Some of that speed comes from updating only the parts of the DOM that need it. Less for you to worry about and a speed gain to boot. As long as you understand the workings of setState(), you should be good to go. However, it’s also important to familiarize yourself with how this amazing library updates the DOM of your application. Knowing this will be instrumental in your work as a React developer. The browser builds the DOM by parsing the code you write, it does this before it renders the page. The DOM represents documents in the page as nodes and objects, providing an interface so that programming languages can plug in and manipulate the DOM. The problem with the DOM is that it is not optimized for dynamic UI applications. So, updating the DOM can slow your application when there are a lot of things to be changed; as the browser has to reapply all styles and render new HTML elements. This also happens in situations where nothing changes. Reconciliation is the process through which React updates the DOM. When a component's state changes, React has to calculate if it is necessary to update the DOM. It does this by creating a virtual DOM and comparing it with the current DOM. In this context, the virtual DOM will contain the new state of the component. Let's build a simple component that adds two numbers. The numbers will be entered in an input field. See the Pen reconciliation Pen by Kingsley Silas Chijioke (@kinsomicrote) on CodePen. 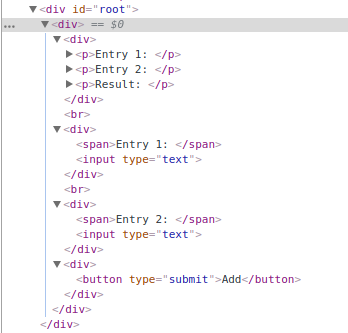 When an entry is made in the first input field, React creates a new tree. The new tree which is the virtual DOM will contain the new state for entry1. Then, React compares the virtual DOM with the old DOM and, from the comparison, it figures out the difference between both DOMs and makes an update to only the part that is different. A new tree is created each time the state of App component changes — when a value is entered in either of the inputs field, or when the button is clicked. When the state of a component changes so that an element needs to be changed from one type to another, React unmounts the whole tree and builds a new one from scratch. This causes every node in that tree to be destroyed. See the Pen reconciliation-2 Pen by Kingsley Silas Chijioke (@kinsomicrote) on CodePen. React uses keys to keep track of items in a list. The keys help it figure out the position of the item on a list. What happens when a list does not have keys? React will mutate every child of the list even if there are no new changes. In other words, React changes every item in a list that does not have keys. Here, we have two arrays that get rendered depending on the state of the component. React has no way of keep track of the items on the list, so it is bound to change the whole list each time there is a need to re-render. This results in performance issues. To fix this, you add a unique key for each item on the list. The best solution in this scenario is to create an array of objects, with each item having a unique id. If we make use of the array index, that will be an antipattern, that will come back to hurt us. See the Pen reconciliation-3 Pen by Kingsley Silas Chijioke (@kinsomicrote) on CodePen. React can make your UI fast, but it needs your help. It’s good to understand its reconciliation process. React doesn't do a full rerender of your DOM nodes. It only changes what it needs to. The diffing process is so fast that you might not notice it. Using item id over index number as a key prop is more efficient. That way when item gets deleted, all other keys of the array stay unmodified.